Thanks. Will do. Toy trains of any sort beyond "Thomas the Tank Engine" push toys are rarer than hens' teeth out here. I'll keep my eyes peeled at garage sales. Kid-zilla wanted trains. Who am I to argue, but it has been squally, and I don't have a good water proof power source. This gave us an excuse to tinker with and really observe Little Thomas. With only one motor forward and the stock axle back in place aft, he really sits "low by the stern." If I put a bit of pressure on the stack, he'll pull. Once my finger is off, he'll do OK on a straightaway, but the powered forward drivers will seize or spin once he comes to a curve. Based on this, I can see if there is a way to raise the rear axel. I think I will go with a bit of weight up front, first, as I fear more tinkering will only lead to new problems. I am really beginning to think the biggest issue with this project was not the intent or the motors but the low baseline from which I had to start. The requirement to jam those gear boxes into that small space seems to have posed a bigger issue in terms of alignment than I anticipated, and I bet if I hadn't had to bend the "ears" for the mounting screws to make the gear box fit the space - or been a bit more precise in the process - Little Thomas would be out on the rails. Live and learn. The project must lurch forward! Oldest Son and I did some tinkering. Contrary to my last post, the rear axel had to be held down. We cut some small styrene shims, placed them over the rear axel and let then perch there partially supported by the lower hull, then carefully set the upper hull in place. Little Thomas now sits on the level! We put him on the track, and he pulls a bit better. A passing squall wet the track, so I am not sure if his stall on the curve was the slipperiness, the lack of power, or the need for a touch of weight over the forward axel. We will wait for clear weather and dry rails before testing. I should mention I did place traction tires on him during an earlier round of puttering, so that direction is closed! One observation I will add for those thinking of using one of these little motors. They run hot! One assisted loop around our little railroad leaves the lower chassis hot to the touch just under the motor mount. I think a better use might me something where the motor hangs external to the bottom of the loco / rail car / critter / whatever with a skirt to hide it. This would minimize the amount of shoehorning, helping to ensure a proper fit, and maximize the cooling. A bit more care in set-up probably wouldn't have hurt in my case, either. If this works, and Little Thomas can make the occasional loop around the track, I will letter him and call the project pau (finished) until I find a motor block or powered tender that allows for a more effective solution. Updates to follow as progress...or lack thereof...merits. Dry rails and sunny weather prevailed, and Little Thomas happily pushed a small low-sided gondola around our folded figure eight with minimal intervention. He did this for about 45 minutes, when the battery ran dry. This moral success merits proceeding to some dry transfer lettering, which I've never done before, and some light weathering, which is a long dormant skill. I lied...I let this sit on the shelf while I focused on DIY power supplies. This afternoon, before passing out in the Valley of the Nap where the Triple O's dogbone pinches to accommodate an avocado tree, I had a fit of inspiration. I disassembled the motor block from my busted B'mann Big Hauler (The chassis went to the MIK 2019 ka'a wa'a; the loco had long since got a new chassis.) 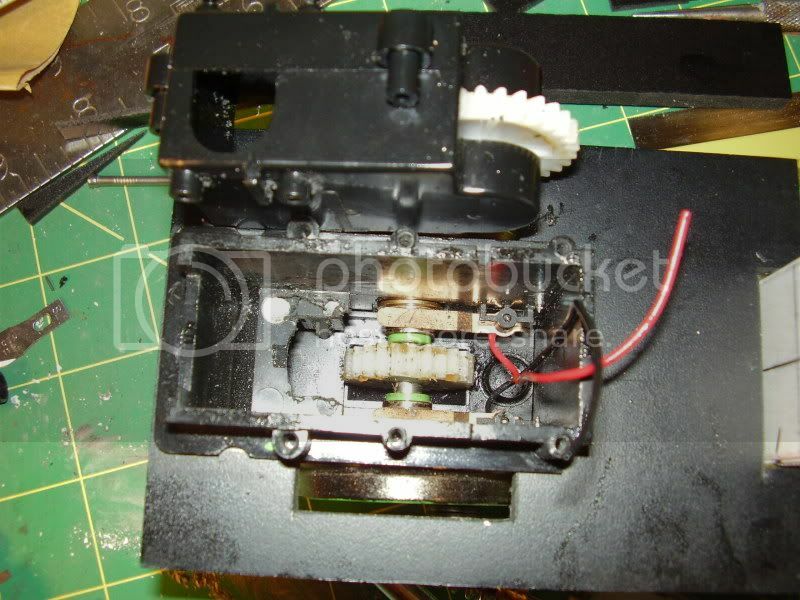 and, for the heck of it, jammed the motor into the lower hull of Little Thomas. It fit laterally and engaged the gear, but it did not fit vertically. Now I am wondering if I could cut the deck of the upper hull to accommodate and craft some sort of motor harness. On the one hand, that takes advantage of parts on hand; on the other hand, it could be yet another "almost" solution. In the meantime, the heat shrink tubing I had used to make the wheels fit the axel of the Tamiya motor / gear block kit gave way. I'll have to work for another "almost solution" to get back to where I was on this project, something that'll creep along pulling a car. The saga continues. Good thing I have those power supplies to build and a bridge to design! 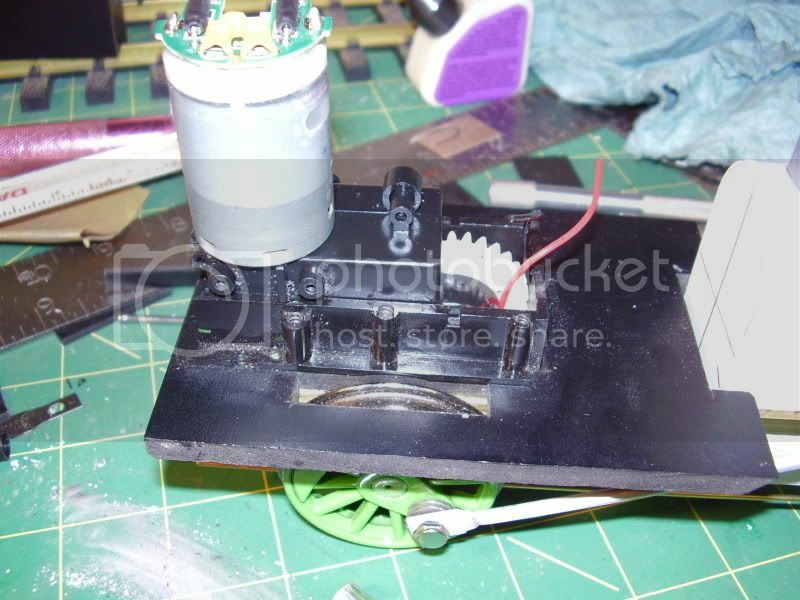 Modifying Percy's gear box and eliminating unnecessary gearing for a vertical drive into another model. Perhaps this helps or maybe not. To the left is the surviving Tamiya motor and gear box. As mentioned, the axels are too small to take the wheels. To the right is the salvaged B'mann motor. You can see the worm gear engages the metal gear on the original axel almost perfectly. I ran some wires from a 9V battery to the motor. It'll turn the wheels. I bought a 4.8V rechargeable battery for this project, which should be plenty if I wire it via the DPDT switch to the B'mann motor. Little Thomas is supposed to become bare bones plantation loco, so speed will not be of the essence! 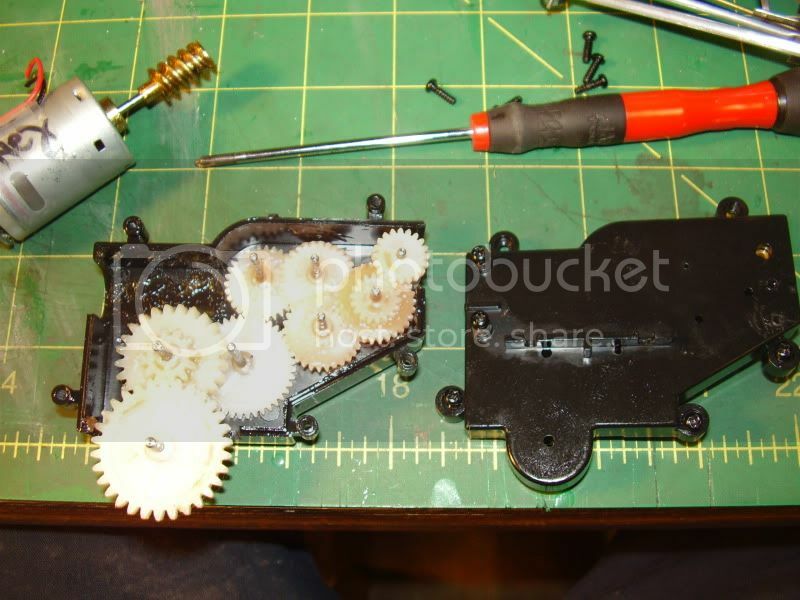 I had considered mounting the motor vertically, but there is not space to go straight from motor to gear. 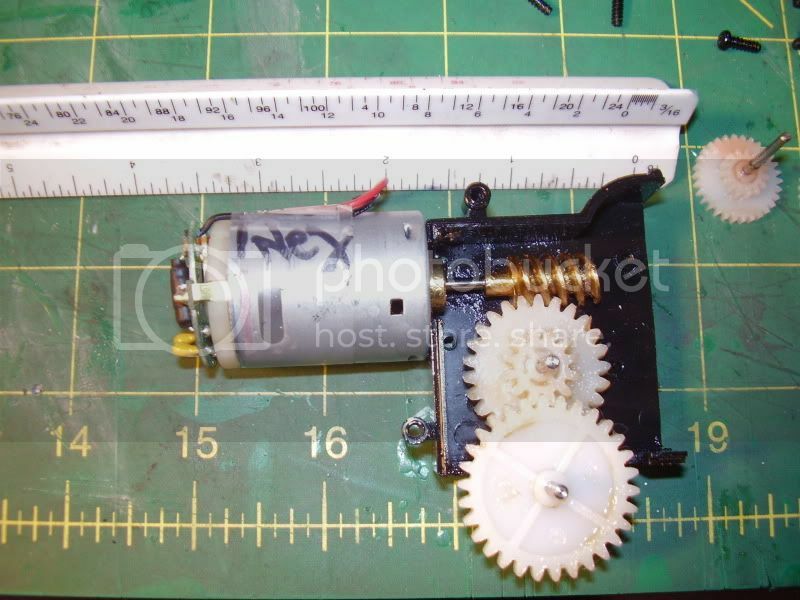 I could look for R/C car or aircraft gears to make a gear box. If I go horizontally, I have to put some shims beneath the motor, then cut away the deck above it, and use the downward pressure of the worm gear on the drive gear to hold the axel in place vertically. The next issue would be holding it in place. It is a tight fit laterally, so arresting vertical movement should be the only issue. Either way, the Tamiya components would come out, the wheels would go back on the original axel, and then I'd have to design a way to keep the forward axel in place, as cutting out the innards to make way for the Tamiya gear box lets the axels travel almost 1/8" vertically. Thanks again for the assist!